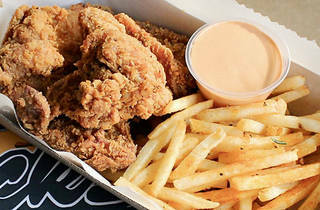 Fried chicken is an iconic Southern USA dish and there are a few places around Hong Kong where you can enjoy it. One such eatery is Restoration, which has grown in popularity thanks to chef Jack Carson. So when we hear he is opening a new joint focusing on his famous fowl, we’re ecstatic. 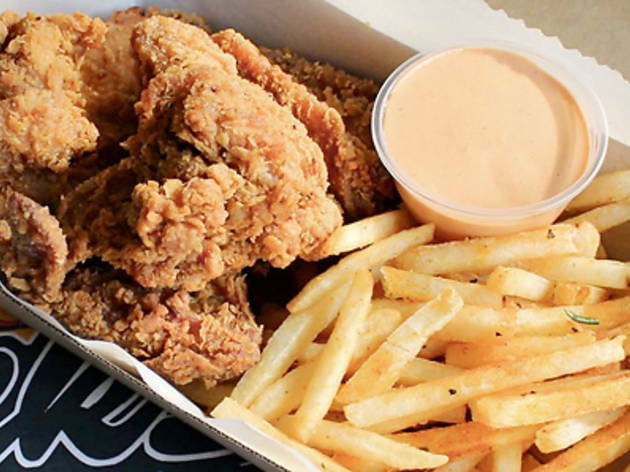 Jack’s Fried Chicken takes up a tiny store in Kennedy Town. There are only three bar stools and a graffiti-style sign in the joint. But the aroma of Cajun spices outside the shop is enough to get us salivating. We order the boneless chicken thigh ($80) and a bacon chicken burger ($80), which the staff insist is drool-worthy. The lightly spiced chook meat nestles in a crunchy batter and is enveloped by crispy bacon and onion rings. It hits all the notes and flavours of the South. The bun is a little weak and becomes paper thin quickly but we do love this dish. We don’t, sadly, feel the same about the fried chicken thigh. The crispy batter is as good as it is at Restoration but somehow the spices haven’t translated well at Jack’s. Jack’s Fried Chicken 78 Catchick St, Kennedy Town, 2755 5547; fb.com/jacksfriedchickenhk. Dinner for two: $200.